Healthy Delicious Syn Free Rosemary Roasted Potatoes, Parsnips, Carrots and Onion the perfect addition to any main meal. 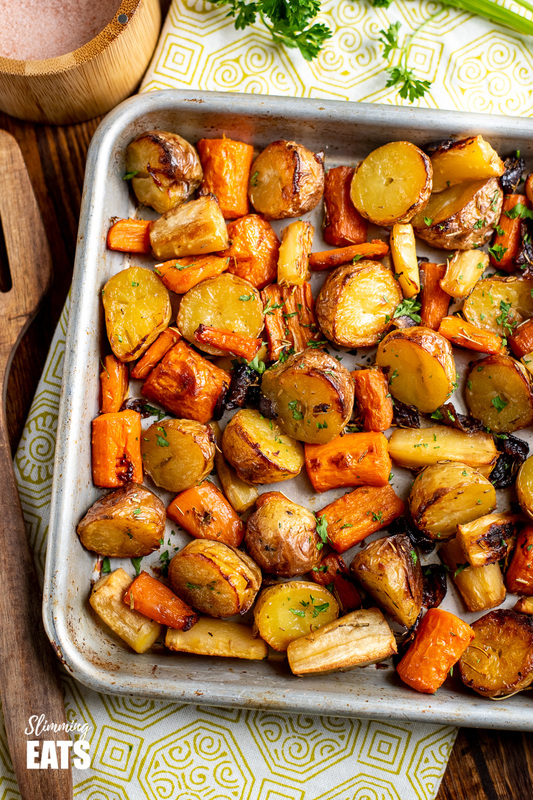 When it comes to vegetables, there is nothing more satisfying than a beautiful tray bake of roasted vegetables, those lovely healthy colour of natural food and nothing artificial. 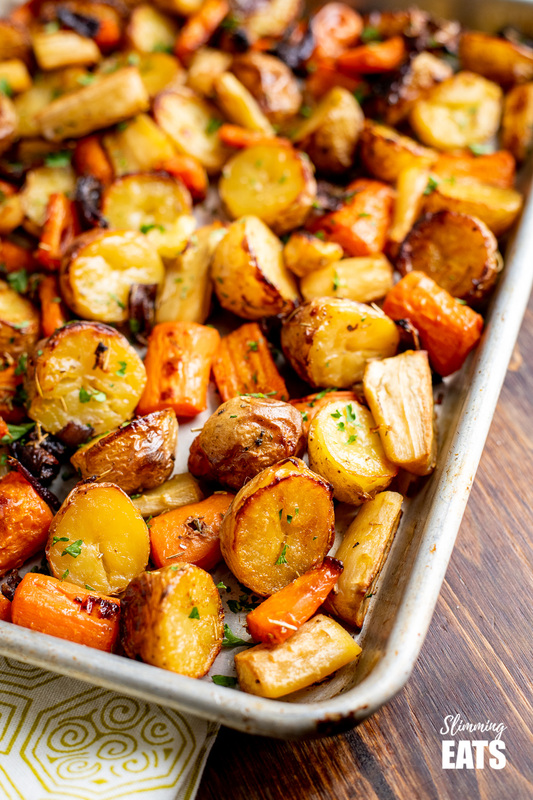 I love roasted vegetables, it really enhances the flavour, especially when you add some seasoning or fresh herbs and can easily be made to accompany whatever main dish you are making with the flavours you choose to add. For this tray of Roasted Vegetables, I just went for some simple garlic, salt, black pepper and herbs such as Rosemary, as I planned to serve it with this Slow Cooker Chicken Mushroom Meatloaf and boy was it delicious. Usually when roasting any kind of vegetables and a good drizzle of olive oil is the preferred method, but using olive oil spray oil and a little stock, I manage to make these equally delicious while still being syn free. The stock method is a trick I use in lots of recipes and it really does work in place of oil. 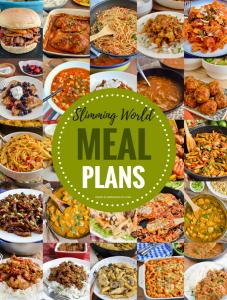 Of course, there is nothing wrong with using olive oil, it’s one of the healthiest oils out there, so you if you have syns to spare, then definitely use it. But I’d already used quite a few syns today, so wanted to keep this side of Rosemary Roasted Potatoes, Parsnips, Carrots and Onion syn free. I do recommend using baby potatoes in their skins, they are so much tastier roasted and think of the fibre, plus they are lower GI too. I use baby Yukon golds which have a gorgeous yellow colour and an amazing buttery flavour. So you can imagine how good these taste roasted. 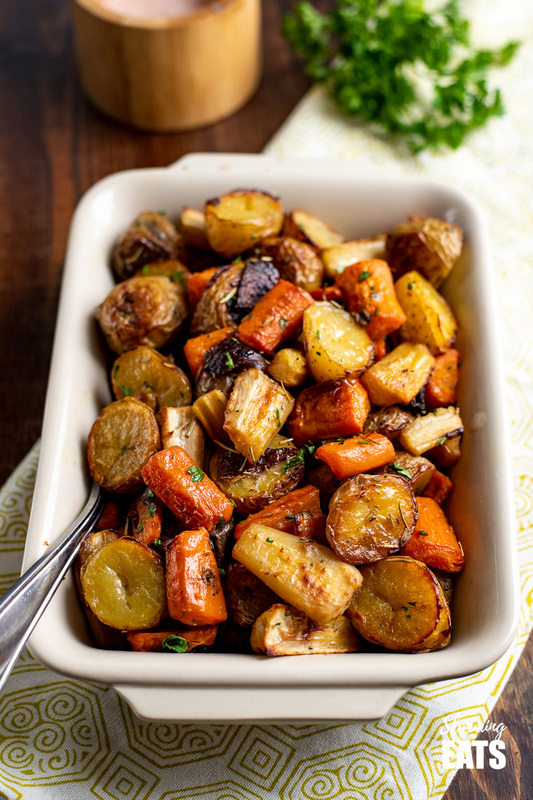 Hey, I’ve even been known to dig into just a bowl of this Rosemary Roasted Potatoes, Parsnips, Carrots and Onion with a little crumbled feta on top as part of my healthy extra A choice – yum!! or even a bowl with some of these yummy Syn Free Gravy drizzled over the top. Both are perfectly acceptable meals – don’t judge me. When you have leftovers, sometimes it’s just about the simple things, right? 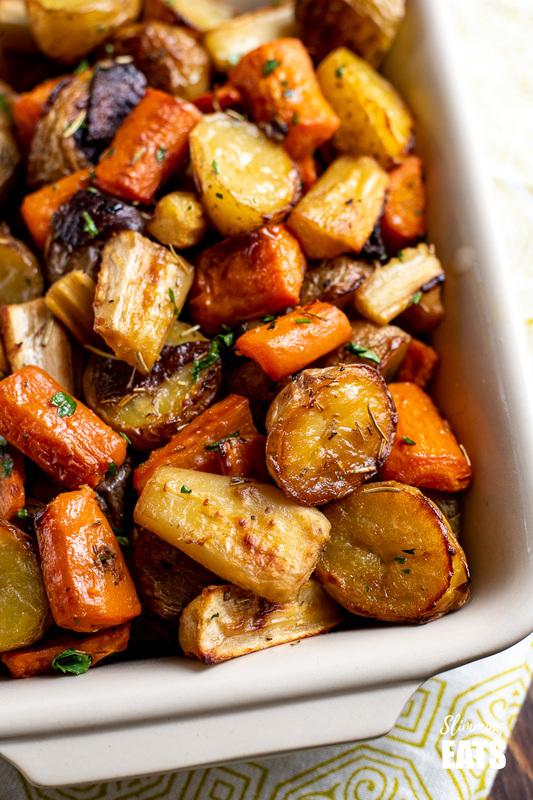 The carrots and onion will count as part of your speed foods, but you can treat this as your potato type side to any main meal, and then add some additional greens. 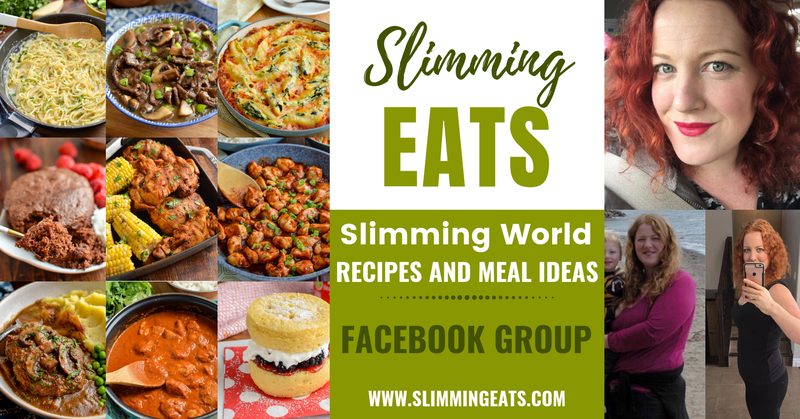 The Sauteed Garlic Shredded Brussels Sprouts go really well – just saying!!! But remember speed foods are recommended, not compulsory, so it’s no biggy if you have the odd meal that does meet the full 1/3 speed foods criteria. So long as you aim for it at most meals then it’s fine. 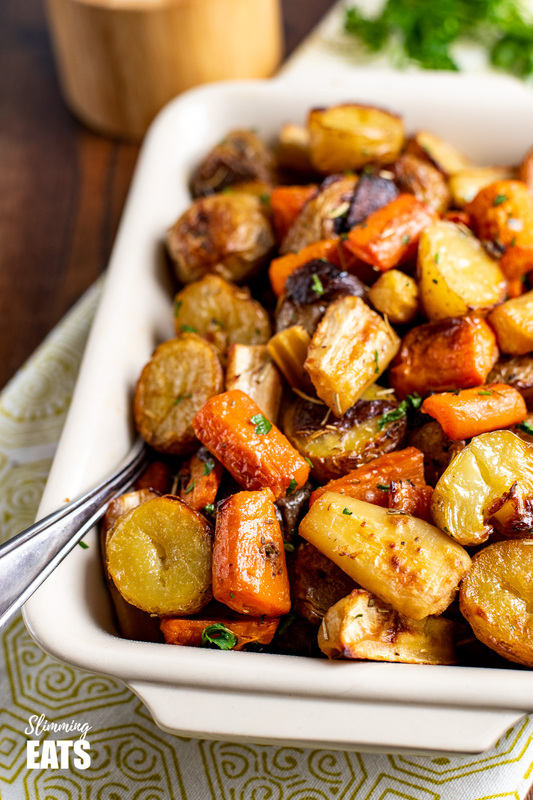 Kitchen Items use for the Syn Free Rosemary Roasted Potatoes, Parsnips, Carrots and Onion ? 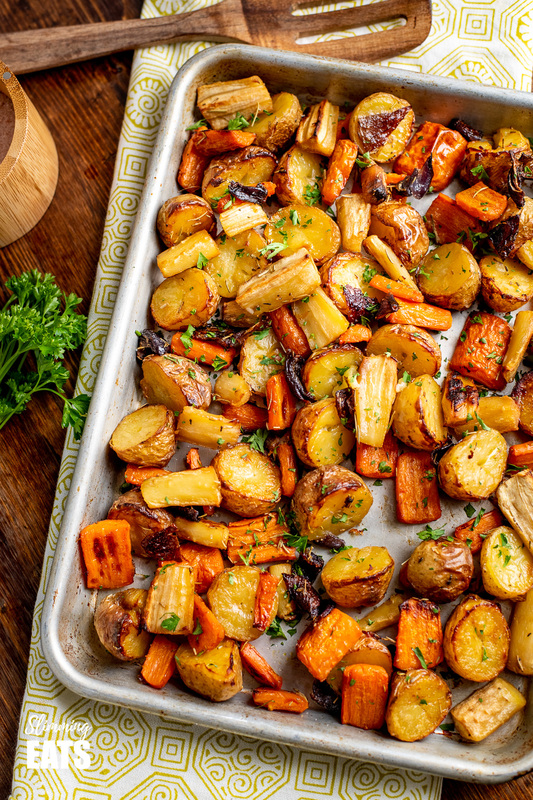 Healthy Delicious Rosemary Roasted Potatoes, Carrots, Parsnip and Onion the perfect addition to any main meal from chicken, to fish and even vegetarian dishes. 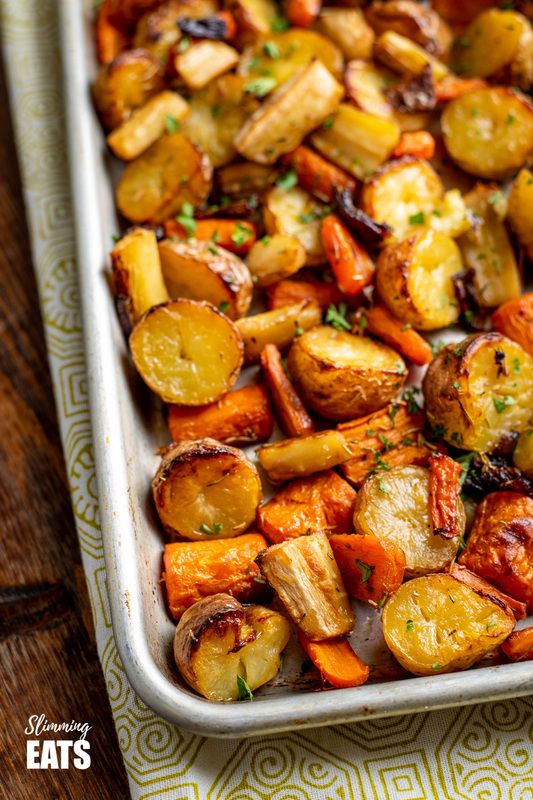 Drain potatoes and add them along with the carrots, parsnips, onion and garlic to a large baking tray lined with parchment paper, spread well out. Sprinkle with the rosemary, salt and black pepper. Pour the vegetable stock over the top. Then with the olive oil spray. Roast for 40 minutes until softened lightly golden. Sprinkle with the fresh parsley. This dish looks AMAZING! Potatos are delicious in so many ways… 🙂 I absolutely ♥ the idea of freshly cut rosemary as seasoning! This looks lovely, I am going to do this with my gammon steaks tomorrow night for dinner. Thank you for the inspiration.